Masterpress/Getty ImagesFantasy leagues are split on how to handle Shohei Ohtani. 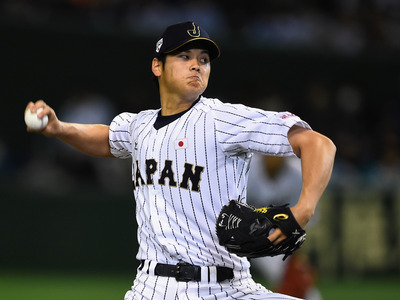 Shohei Ohtani is the latest Japanese baseball star to make the jump to Major League Baseball as a member of the Los Angeles Angels. Ohtani is a two-way player and his unique skill set has caused issues for fantasy baseball leagues. Some fantasy baseball leagues are allowing players to draft Ohtani twice, once as a pitcher and once as a hitter, which could lead to Ohtani being on two different teams at the same time. Other leagues are only allowing Ohtani to be drafted once. ESPN has figured out how it will let fantasy baseball players use incoming two-way phenomenon Shohei Ohtani. For the purposes of ESPN fantasy baseball leagues, Ohtani will count as one player, whom players can choose, before the beginning of each scoring period, to start as either a pitcher or a hitter. ESPN’s decision differs from that of Yahoo!, who have opted to create two distinct fantasy Ohtanis for players to draft and own. This could lead to odd scenarios where Ohtani is on two teams in the same league. As far as real baseball is concerned, the Angels see Ohtani primarily as a pitcher, before deciding upon his offensive role, according to ESPN. The Angels will use Ohtani in the rotation before deciding how often he will be used as the team’s designated hitter. In an interview with Awful Announcing, Pierre Becquey, ESPN’s deputy editor for fantasy and esports, explains how the site came to this decision. Either way, that Ohtani has caused such a debate within the world of fantasy baseball is in and of itself a testament to how unique and exciting of a player he is.